Jean-Baptiste André continues to research the body, the topic of identity, and the notion of metamorphosis in his new work, comme en plein jour (as in full day). Jean-Baptiste is fascinated by the metamorphosis figure and how the body, in a wide and clear space, can create shapes and form. This diptych to 2004’s Interieur Nuit is powered by an electronic score, where circus, dance, and video art meet in a world of uncertain identity, shifting color, startling landscapes, and skewed perspective. The exhibit is also sponsored by the Cultural Services of the French Embassy and the French Consulate of Houston. The Texan-French Alliance for the Arts and its presenting partner, The Levant Foundation, are proud to sponsor Jean Luc Mylayne, the first solo exhibition of the French photographer in an American museum. The exhibition, on view at Blaffer Gallery, the Art Museum of the University of Houston from September 8 through November 10, presents portraits of bluebirds, hummingbirds, juncos, and other species of birds in the habitat of Western Texas. A constant theme of the show is the reflection of the relationship between humanity and nature. The mission of the Texan-French Alliance for the Arts is to promote artistic and cultural exchanges and educational programs between Texas and France. In funding exhibitions such as Jean Luc Mylayne, the alliance hopes to develop a broad audience and cultivate the appreciation of different art forms, thus strengthening cultural awareness between Texas and France. In collaboration with the University of Houston Downtown and Musiques de Nuit, Bordeaux. Nine interns from Bordeaux, France join thirty American students under the direction of Robert Wilson, Director of the University of Houston-Downtown Civic Music Program, and Grammy Award participant Tony Campise and Lynn Seaton for two extraordinary jazz concerts. On view from June 8 through September 16, 2007, the exhibition features works by Max Ernst, René Magritte, Jackson Pollack, Mark Rothko, Jean Tinguely, and African, Oceanic, and Pre-Columbian art. The exhibition opens on the Menil Collection’s 20th Anniversary date. HOUSTON, May 18, 2007 — A MODERN PATRONAGE: de Menil Gifts to American and European Museums continues the Menil’s celebration of its 20th anniversary. Organized by Menil director Josef Helfenstein, this exhibition brings together for the first time approximately 45 major works of art that John and Dominique de Menil donated to museums in Europe and America, including the Centre Georges Pompidou, Paris; Musée du quai Branly, Paris (formerly the L’Musée del Homme); the Museum of Modern Art, New York (MoMA); the Museum of Fine Arts, Houston (MFAH); as well as The Menil Collection (which opened to the public on June 8, 1987). Beginning with works purchased as early as the 1940s, the exhibition presents attests to the de Menils’ interest in establishing a conversations between significant 20th-century artists ; — including Max Ernst, René Magritte, Man Ray, Mark Rothko, Jean Tinguely, Wols, Lee Bontecou, Jackson Pollock, Claes Oldenburg, Larry Rivers, and Andy Warhol , — and important selections of African, Oceanic, and Pre-Columbian art. Accompanying the exhibition is a fully illustrated catalogue, with essays by Marcia Brennan, Alfred Pacquement, and Ann Temkin, exploring the complex set of circumstances that inspired the development and international reach of the de Menils’ artistic vision. Pacquement, the director of the Centre Pompidou, Paris, discusses Dominique de Menil’s pioneering role in bringing modern American Art to France in the 1970s. The couple’s belief in individuals and objects vision led them to make deep their commitments to particular artists, including, famously, Surrealists such as Magritte and Ernst, and Jean Tinguely. Visiting the Swiss sculptor’s 1964 show at Alexandre Iolas’s Paris gallery, John was so inspired by what he saw, and heard — a cacophonous gathering of spurting and rocking machines consisting of rubber belts and electric motors — that he purchased every work on display for the MFAH. A selection of these Meta-Mecanique sculptures will be assembled for A MODERN PATRONAGE. Demonstrating a truly modern patronage, the de Menils’ role as collectors transcends the works of art held by The Menil Collection, and this exhibition honors their international scope and presence. Xavier Le Roy was a researcher in molecular and cellular biology when he decided, at the age of 27, to dedicate himself to dance. DiverseWorks presents Le Roy’s monumental work Self Unfinished (1998), in which he elevates the deconstruction of the body to a level of poetry. In an empty space and using a minimum of theatrical means, the choreographer-dancer unveils the thousand bodies hidden behind the daily image of the human body. With humor, irony, and extreme rigor Xavier Le Roy invites us to a continuously changing presentation of strangely familiar deformations. To celebrate the 20th anniversary of The Menil Collection, a masked ball will take place on April 20th: a festive evening of masks, art, fine cuisine, music, and dancing with the extraordinary participation of architect Renzo Piano and His Excellency the Ambassador of France, Mr. Jean-David Levitte. By the time Robert Rauschenberg completed the first of his Cardboards in 1971, he had already been breaking ground as an artist for twenty years. He first gained international acclaim in 1958 when he exhibited twenty of his Combines at the Leo Castelli Gallery in New York City. By amalgamating an unprecedented variety of discarded objects, materials, and artistic techniques, the Combines not only provided the first significant break with the tenets of Abstract Expressionism, but also introduced a new type of art object, neither sculpture nor painting, neither abstract nor representational. The Cardboards present a continuation of the found-object tradition and the exploration of the boundaries between painting and sculpture that the Combines began. The artist’s approach here, however, was radically transformed. Lacking the palate of refuse provided by New York City, Rauschenberg, who had recently moved to Captiva, Florida, turned his attention to what he discovered in his new environ. 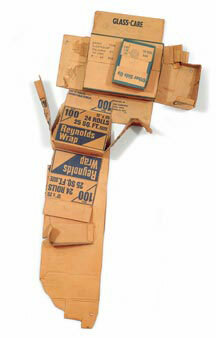 While Rauschenberg had included any and all materials in his Combines, in the Cardboards, he confined himself to only one: discarded cardboard boxes. Rauschenberg tore, flattened, bent, and cut the boxes that constitute this series; however, he resisted otherwise embellishing their surfaces. Thus, the stains, tears, dents, and marks that enliven the compositions result from, and attest to, the history of the objects themselves. He managed in this series to blend the inferior with the precious, to bring to the surface the hidden “cultural” qualities of this ordinary material by transforming it into great art. Inspired by his new material, Rauschenberg produced a number of other series that developed the original concept in different ways. Working with the printers at Gemini G.E.L. in Los Angeles, Rauschenberg produced Cardbirds (1971-1972), a series of faux cardboard box constructions using silkscreen on cardboard. Later he collaborated with Graphicstudio at the University of South Florida to create the series Tampa Clay Pieces (1972-1973). In both of these editions, the look of ordinary cardboard boxes belies the sophisticated techniques developed by the artist and the printmakers to create them. are poetic impressions of Venice, a city whose decaying beauty struck a chord with Rauschenberg’s own aesthetic. As he had in the Cardboards, he continued to let the history of the objects inform the content and aura of the artworks, but using a wider variety of objects, he expanded the three-dimensionality of the works. Inspired by a book on Egypt, Rauschenberg created the Early Egyptians series (1973-1974). He began with the simplified, minimal look of the Cardboards, but rather than flattening the boxes, he left them intact, coating them in glue, then rolling them in sand or wrapping them in gauze like mummies. Day-Glo paint applied to their backs casts a soft steady light onto the wall behind them when they are properly installed and lit. Despite Rauschenberg’s fame there are still important aspects and periods of his work that are practically unknown, even to specialists. For this reason, The Menil Collection decided to organize “Robert Rauschenberg: Cardboards and Related Pieces.” In October 1971, the Leo Castelli Gallery in New York presented “Cardboards and Cardbirds,” but since then the series has largely been ignored. “Cardboards and Related Pieces” is the first museum exhibition to focus exclusively on this key yet unappreciated period in Rauschenberg’s career. The exhibition is curated by Director Josef Helfenstein and accompanied by a fully illustrated catalogue.